This article was published by ComputorEdge , issue #2642, 2008-10-17 , as the cover article, in both their PDF edition (on pages 7-17) and their website. Musicians oftentimes need to create their own sheet music, whether for recording their own compositions, transcribing existing compositions into another key signature, or making different parts of an instrumental choir piece. Regardless of the reason, various methods of creating sheet music have developed throughout the history of playing musical instruments and composing pieces for them. Millennia ago, prior to formalized writing, vocal songs and folk music played on primitive instruments, were passed from one generation to the next in the form of oral tradition. This was eventually supplemented with — but never completely supplanted by — written sheet music utilizing pairings of parchment, papyrus, or cellulose paper, in conjunction with ink, charcoal, and other materials. The musical scribes of yesteryear most likely believed that the only keyboards that would ever be used for creating sheet music, were those of pianos, harpsichords, and other stringed instruments. One can only imagine what they would now think of professional and amateur musicians tapping out notes on a computer keyboard, or using a mouse, and then printing letter-perfect sheet music at the touch of a button (or, more accurately, the Print menu item on the File menu). Those ancient musicians would no doubt think it miraculous (or perhaps the work of a post-Paganini devil) to be able to input a full score of musical notes — even with extensive notation — in a matter of minutes, and then generate one pristine copy after another, as fast as one's laser printer could crank them out. Yet these capabilities are enjoyed by music aficionados the world over, and in this article I will show how to perform such musical magic ourselves. Just as musical instruments come in all shapes and sizes (to say nothing of the musicians themselves), so do sheet music programs. They also have quite a range of price tags, such as Busker, at only $29.95, and, at the opposite end of the spectrum, Sibelius 5 Professional, at $599. Sibelius does have a stripped-down version, Sibelius First, priced as low as $129. The company also offers Sibelius Scorch, at no charge. But it does not allow you to create new music; it can only be used to view, play, customize, and print scores on the Internet. There are even some free music composition programs available, from the world of open source software, such as ConForza. Note, however, that they are free only if you put no value on the time typically wasted trying to figure out how to compile and install the programs. Sibelius Professional is frequently the program of choice of music… well, professionals. But is not the only one. Vivaldi Studio is a higher-end option, and, like the other heavyweights, it too has a program, Vivaldi Scan, that can scan in printed sheet music, recognize the notes and other symbols, and convert it into electronic form — similar to optical character recognition (OCR) programs, which can read printed text and turn it into an online document. The main competition for Sibelius appears to be the Finale series, created and distributed by MakeMusic, Inc., and billed as the "premier family of music notation software". The company offers several versions, for different needs: The flagship product, Finale, contains most if not all of the functionality seen in Sibelius Professional, and goes for $600. Finale Allegro is a less complex application, and is aimed at music educators and students. 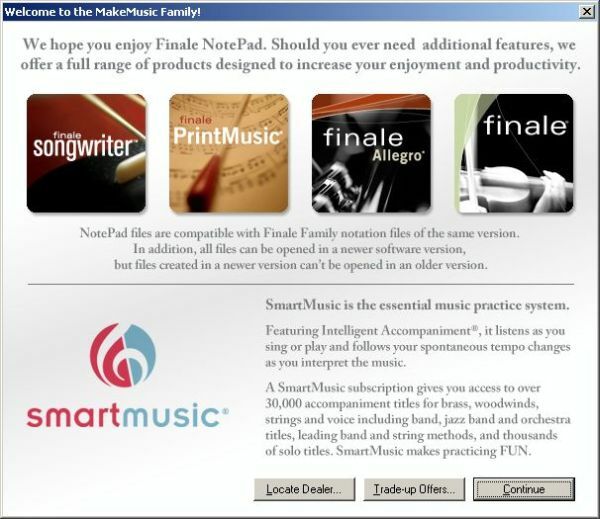 Finale PrintMusic has more features than Finale SongWriter, which is labeled the entry-level version with reduced functionality and price. 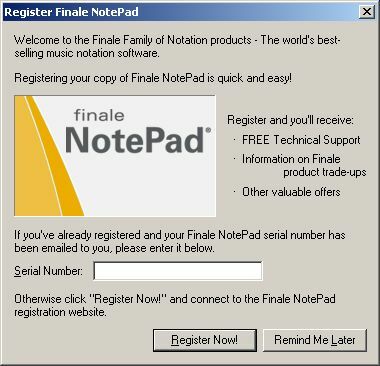 But the true entry-level version has to be Finale NotePad, which is completely free of charge, and yet offers much of the functionality seen in all of the previously mentioned programs — possibly enough to satisfy most amateur musicians. You can read sheet music created using any Finale product. You can create your own sheet music, entering notes using a keyboard or mouse, import MIDI files, set a key signature, enter standard guitar and bass tablature, play the music on your computer speakers (limited to 128 sounds), print your sheet music, and share your compositions with others on the Internet (more on that later). It lacks some of the features that come with all of the other Finale products: note entry using a MIDI device, the quick-start videos, import of MusicXML files, automatic chord symbols, guitar fretboards, chord charts with slash notations, percussion notation, save as audio file. Like SongWriter, it lacks music scanning, predefined templates, real-time entry from an acoustic single-line instrument, unlimited lyric versus, a built-in mixer, and is limited to eight staves and five staff lines (plus tablature). Time signatures are compound only, and not additive. There are more limitations, but none that should prove a barrier to anyone who wants a simple music notation application. 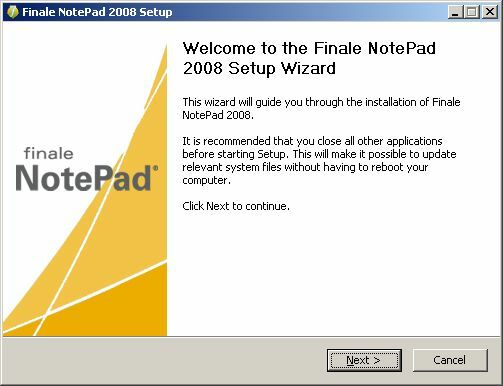 To try out Finale NotePad, go to its Web page and click the appropriate download link for either Windows or Mac OS X. 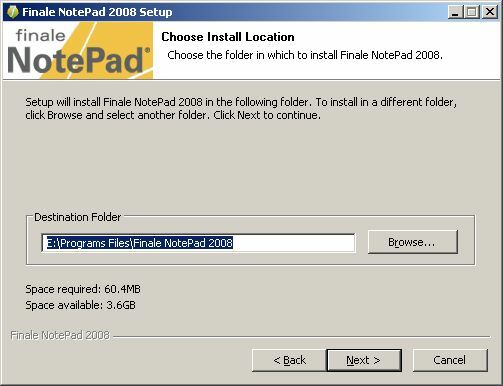 The current version is NotePad 2008. If you would like the application on CD-ROM, you can order one for $19.95. Unless you have no Internet connection, and can borrow anyone else's, it is faster and cheaper to simply download the installation file, whose size is fewer than 39 megabytes. To download it, you are required to create a customer account. Save this information, because you will need it later to upgrade to a more advanced version of Finale, to access the MakeMusic archive, and to be eligible for other benefits. At the download screen, beneath the green download button, you are given a serial number (blacked out in the image below). Record your individual serial number for future use. Save the installation file to someplace on your PC where you can find it, and then start the installation process by running that file. 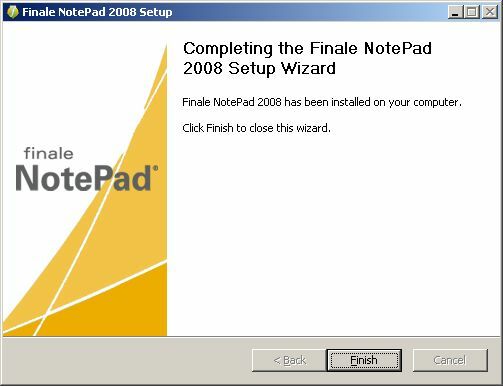 The NotePad install wizard starts. 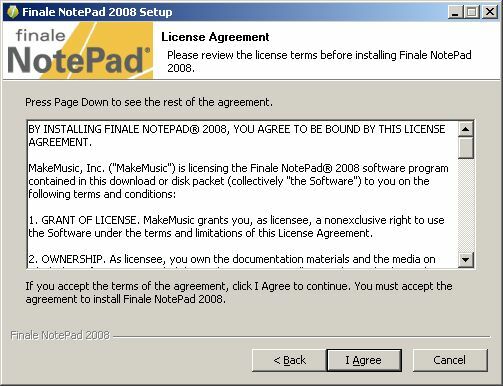 Click the "Next" button, to see the license agreement. After reading every word of the license agreement (doesn't everyone? ), click the "I Agree" button, to set the folder in which NotePad will be installed. You can use the default value for the location. Once the installation process is completed, you will see the dialog box shown below. 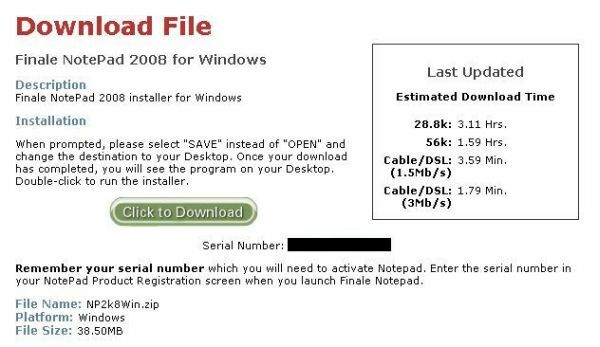 Start up NotePad, at which point you can enter that serial number provided earlier. You can also set your MIDI device, if applicable. Every time you start NotePad, you will see a welcome screen. You can hit your Escape key or click the "Continue" button. NotePad assumes you would like to create the sheet music (a "document") for a composition, and thus its document setup wizard prompts you for a song title, composer, etc. In this example, I will do "Liebestraum" by Franz Liszt. You are then prompted to specify one or more musical instruments for your new document. Lastly, you are prompted to set the time and key signatures of the composition, as well as the number of measures. You can always add or delete measures later. When you begin creating new sheet music, the default mode is for entering notes, as indicated by the purple note seen in the figure below. In this example, if I were to hit the Enter key, it would insert a B flat eighth note. All of the subsequent operations within NotePad — inserting notes and rests, setting accidentals, etc. — are controllable with the menu items and toolbars. To learn more about them, simply press the F1 key or choose an item from the Help menu, which includes information on commands, tutorials, and keyboard shortcuts. While NotePad is immeasurably (no pun intended) superior to pen and paper — to say nothing of charcoal and parchment — it is not perfect. In addition to the functional limitations mentioned earlier, it will occasionally format notational elements poorly. For instance, in the figure below, which shows the 26th measure of our sample composition, the tuplet of eighth notes (Bb, Ab, G — indicated with a subscripted 3) is confusingly merged with the preceding G eighth note. However, despite some minor problems, Finale NotePad is indispensable for sheet music notation. 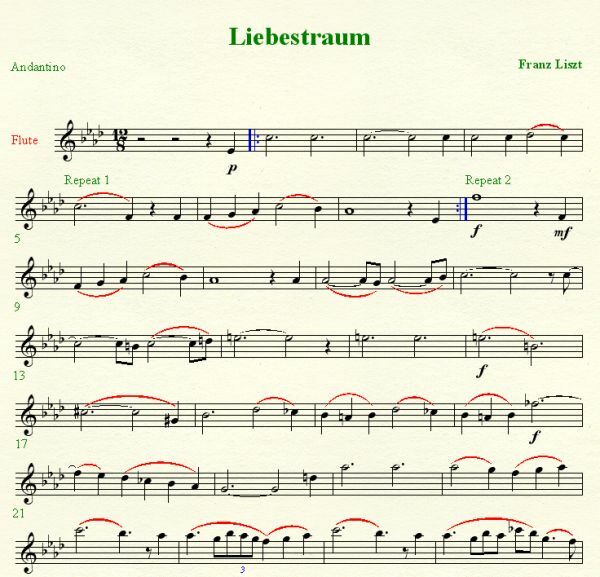 In the figure below, you see the first portion of the first page of our sample score for "Liebestraum". Once you have become comfortable using Finale NotePad for recording your own compositions, as well as those of other composers, consider sharing your work with fellow music lovers, by uploading your sheet music files to Finale Showcase. You will need to login using the account information that you had provided earlier, in the download process. For musicians, music teachers, and novice composers on a budget, Finale NotePad can greatly improve the creation of sheet music, just as TurboTax eases the process of tax form preparation. But NotePad is a lot more enjoyable! [The website changes] all looks great.